The World's largest Hot Dog fast food chain has opportunities throughout <?xml:namespace prefix = st1 ns = "urn:schemas-microsoft-com:office:smarttags" />California, the Pacific Northwest and the Southwest! With over 350 restaurants, Wienerschnitzel is the largest hot dog fast food chain in the world, selling over 80 million hot dogs per year. 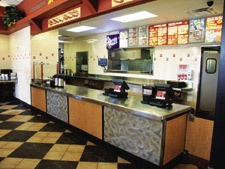 A Wienerschnitzel franchise offers ambitious individuals an opportunity to own their own business and be a part of the hot dog segment leader in the fast food industry. Wienerschnitzel began over 40 years ago with the first menu consisting of hot dogs and sodas. Today, hot dogs remain the core product, but our restaurants also feature a wide menu of burgers, french fries, sandwiches and an optional breakfast menu. Q. How much liquid capital will I need to open a franchise? A. The minimum liquid asset requirement is $200,000, with required net worth of $700,000. Q. How much training do you provide? A. We provide six weeks of training in all facets of running the restaurant and business operations. A. No, however we have established relationships with banks and financial institutions familiar with our concept that have made loans to franchisees in the past. Q. Where are you offering franchise opportunities? A. Throughout California, the Southwest and the Pacific Northwest. Q. What sort of experience do I need? A. We prefer restaurant or retail experience, but will consider other professionals with business ownership experience. Join the industry's niche leader! To learn more about the Wienerschnitzel food franchise opportunity, simply complete the form below.